What wonderful memories, and what a wonderful tribute to your parents (in the painting). I imagine making changes drawing with an iPad are a lot less messy than when you pull out paints, the deep red makes everything else appear richer to me. Thank you Robin. The good thing is I don't tear up the paper when erasing and the pencil doesn't smear. With this app, there's a "rewind" button. Unfortunately, it only rewinds so far. I had played around with watercolor cloud effects and had to re-pencil in the background and re-draw most of the edges--I almost wore out a stylus. Play and learn. I like the story this painting tells. What wonderful memories for you in this. Hi Carole. One of my childhood FB friends said she could see my parents--Robert and Estelle--in this drawing. Church was a huge part of their lives. Thank you. You're catching up on your reading tonight? Just love this painting, Hallie. I love the calm, the colours, the male, the female, the chairs sitting in the grass. Such lovely memories. Can you believe it's November already? Shocking how quickly summer disappeared and how fast we're skipping through fall. Thanks Carole. This is a good memory and I could have done a painting in the time it took to draw this. I'm doing some rework on it because a friend wants to buy a print--gotta learn how to print or have something printed. Ou weather's been around 70 and beautiful until today--a bit chilly. It is hard to believe 2014 will be here soon. wow...what poignant imagery....it's very touching! There is definitely something so human about a chair! Maybe it is that we occupy them and they are upright. Upright is actually quite a good word for this painting. Your parents were devoted...and solid. Beautiful painting!! Thanks Celeste. This one is almost too close for comfort; I usually make a turn before I get to that place. Using grass instead of a floor gives it that extra twist that is so typical of you , i's a great painting, and I liked the story. Hi Jane. I like the grass, too--I'm not sure why. Thank you. Hallie, I think this is just an amazing composition and what a lovely testament to your mom and dad. I hope you can somehow print and frame this for yourself! Hi CrimsonLeaves. I guess this is a still life without flowers and fruit. I will try printing or having it printed. Chairs can be so evocative! You have given the personalities of your parents to these. Whenever i am stumped with subject matter chairs fill the bill. Hi lifeartist. You've painted some great chairs. It would have been nice to have an actual chair to paint from but my furniture is a bit mid-century modern. Everything about this Hallie is wonderful! I love the mismatched chairs, the symmetry, the southern influence, the reverence. It's a beautiful memory. The story you told with it is a great reflection of southern life. The grass floor was a spectacular choice. Thank you PAMO. I hadn't thought about reverence but you're right--it shows in this one. I got a bit caught up in the details here because I was really enjoying drawing (I stopped myself before adding some buttercups to the grass). If I paint this, I'll probably give the chairs roots--maybe that's why I chose grass. Hallie- roots on the chairs will be magnificent! This is just beautiful. This is wonderful. Tells a story, even before reading your words. Your postings have motivated me to try Paper. Thanks, Jean. Paper's advantage is that it can be printed as a sketchbook. I could have done this same drawing in my other apps--Procreate or SketchbookPro--you might want to check all the apps. I am absolutely amazed that this is an app. But besides that, the drawing is adorable - I don't know why, but that is the word I come up with. And touching. And the concept is ingenius! It seems simple, but it is not - so much information is there. And the drawing, of course, is excellent! Adorable!! Does that mean this is kitsch? It is close. I would hate to become sweet in my old age; my defense is everyone recognizes this as my parents. Thank you, Dan--you should try some apps. This crisp style with deep textures and shadows is something I love. Came by as a visit from Dan's Canvas which I have not visited in a long time. Thank you, Tabor. Dan's Canvas is an interesting blog, picture-wise and writing-wise. Hallie,as always, you have you own unique approach to art. Mary, I think everyone has her own way of seeing and interpreting. Your way is lively and full of life. Thank you Cathy; I enjoy all of your blogs. Even without the people concerned these chairs are so full of life , reflecting the personalities of mom and dad, love your unique approach of telling a story through symbolism, there is more here than just to seeing. Thank you Padmaja. Your beautiful sunsets tell stories, too. 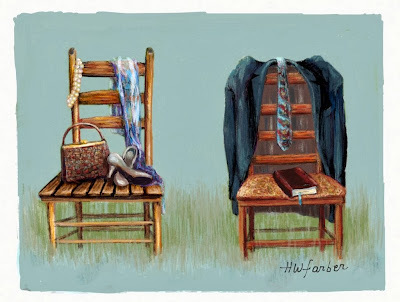 The chairs had been in my mind for a long time. 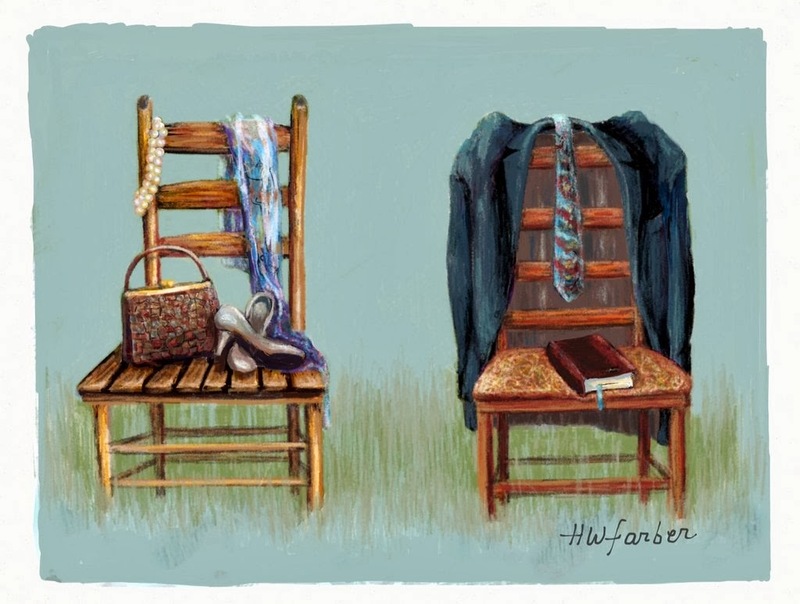 I had thought of having the space between the chairs symbolize the years between their deaths--I let that go. Magnifique travail! .Très joli post! je te souhaite aussi de très belles fêtes de fin d'année accompagnées de joie et bonheur ! Belle journée à toi, et merci de tes visites sur mes pages! Thank you Cathy--and you have some amazing photos. It shows the amount of work you put into it. It is a phenomenal iPad drawing. Great skill. Paper is one app I have't investigated. You've aroused my curiosity. No stylus, just your finger? Wow. Hi Linda. I definitely use a stylus on something like this--and a lot of zooming in.